All this talk about larger and expanded “sweet spots” on your driver, by all of the O.E.M. companies (Taylormade, Nike, Callaway, Cobra, Cleveland etc. ), is just some more of their marketing ploys to fool you into getting into your wallet. Time and time again you see in their ads all the technical ballyhoo about how their drivers have a larger sweet spot, to help you hit the ball further. Sorry to disappoint all you golfers, but there is no such thing as a sweet spot. Bear with us as we will give you the technical explanation of your driver’s center of gravity, and then try to simplify it further on. The (CG) of a wood heed is a tiny pinpoint inside the head, located at the intersection of all possible balance points of the club head. The technical definition, of the CG is referenced as a dimension on each of the three axes of 3-dimensions. The X-axis location of the CG represents how far the Cg is from the centerline of the hostel bore. The Y-axis location of the Cg tells us how high the Cg is straight up from the lowest point of the sole, and the Z-axis position is how far back the Cg is from either the center of the hostel bore or the face. Simple EH? Just study the above images and it is quite clear. Why is this important? Because, in order for you to hit your driver with its most perfect potential, you must hit the ball in direct line with it’s center of gravity point. NOT THE SO CALLED SWEET SPOT. How large is it? About the size of a pinhead. Okay, sometimes the CG is referred to as the “sweet spot” of the wood head-or rather the sweet spot is the position where the CG would PROJECT from inside the head onto the FACE. 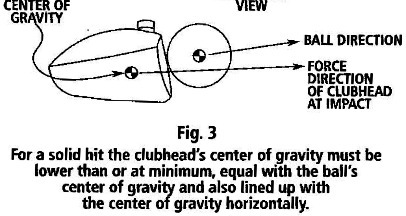 When impact results in the ball contacting this projected point of the CG on the face with the head traveling parallel to the ground, the head will not rotate in any direction vertically or horizontally about its CG, and the maximum transfer of energy from the club head will occur. The ideal situation for maximum distance is for any golfer to choose a driver in which the point on the face which is directly in line with the CG within the head is also the point on the face which has the correct loft angle to generate the golfer’s optimum launch angle. In that sense, the ball will take off with maximum speed and on the best launch angle for maximum carry distance. The COG affects the "true loft" of the club, where you get the maximum ball speed with minimal twisting and where you impart the most spin on the ball off the driver. By hitting just 1/2" below the COG vs. 1/2" above, the difference in spin rate can be well over 1,000 rpm's. This difference for a moderately high swing speed player can equate to 20-30 yards depending on other launch conditions. That's why determining the COG of your driver is so vital to learning how to maximize your drives. Here is how we club makers find the perfect spot to hit the ball on your driver. By balancing a head on a clamped pen, drill bit, nail or any other pointed object, this gives us a non-technical indication of where the head is in perfect balance. 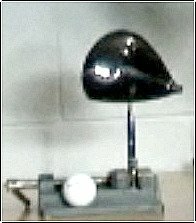 But you can also try bouncing a golf ball on the face and mark the spot where it seems to sound the best and you get a better bounce off the face of the club and the head doesn’t wiggle as much in your hand. By marking this spot with a little dot, we then have our golfers get some face tape, hit balls until they can get the contact as close to the center of gravity as you can. 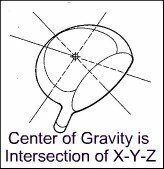 On most golf clubs, the center of gravity will not be the exact center of the club face. It should be slightly inside of center. CONCLUSION It is most important to be aware of where the spot on your driver’s face gives you the ultimate performance. There is much more to fitting a golfer with the correct center of gravity in regards to the effect of loft and proper shaft fitting, but if you do anything, concentrate on analyzing where you are hitting the ball on the face and get it to line up with your center of gravity, and don’t be afraid to experiment.